The Wizards show they have just enough and complete the comeback, 105-103 over the Miami Heat. John Wall and Nene led the team in scoring as each player had 20. Bradley Beal chipped in with 16 points and Paul Pierce had 14 as the Wizards tie their best start in franchise history at 19-6. Even though they won, this was a very uninspiring win. The Heat, already not that great of a team, was missing leading scorer Chris Bosh. The Wizards found themselves down eight at one point in the third quarter. The team’s biggest Achilles heal which almost cost them today is playing down to their opponents level. The Wizards have no problem waking up for the big games, but play down to their opponents level for the “should win” games. Paul Pierce addressed the team after the game reiterating that this is not acceptable if the Wizards plan to make serious noise come the postseason. Defense was the Wizards biggest issue tonight. The Heat shot 53% for the game and 47% from three-point range. The Heat started the second quarter 12-14 from the field and ended the first half shooting a blazing 65%. Fortunately, the Wizards shot 49% in the first half and were only down one, 55-54 at halftime. Nene had probably his best game of the season scoring 20 points on 8-10 shooting. His jump shot from the elbow was falling and he was also very aggressive in driving to the hole. About that jump shot, he didn’t hesitate tonight like he normally does. He received the pass and would go up or drive to the hole. No thinking, no hesitating. Even though Nene had a very nice game, I still believe he should continue to come off of the bench. Aside from Nene, the rest of the bench played very solid tonight as well combining for 47 points. The Wiz took the lead on a tip back from Paul Pierce at the 1:30 mark and the Wizards were able to hang on. 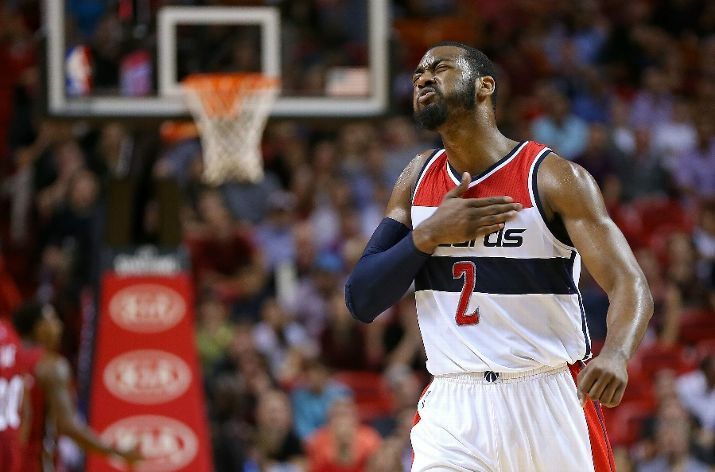 John Wall went to the free throw line twice in the final minute of the game and split both opportunities. This is another issue that could come back to haunt this team down the road as the Wizards missed nine free throws and went 24-33 on the night. At the end of the day, a win is a win is a win. And a win against a divisional foe. Also, we won for the first time in Miami in who knows how long. Not the prettiest game but the team was able to get the job done. See you Sunday when we go for the best record in team history.